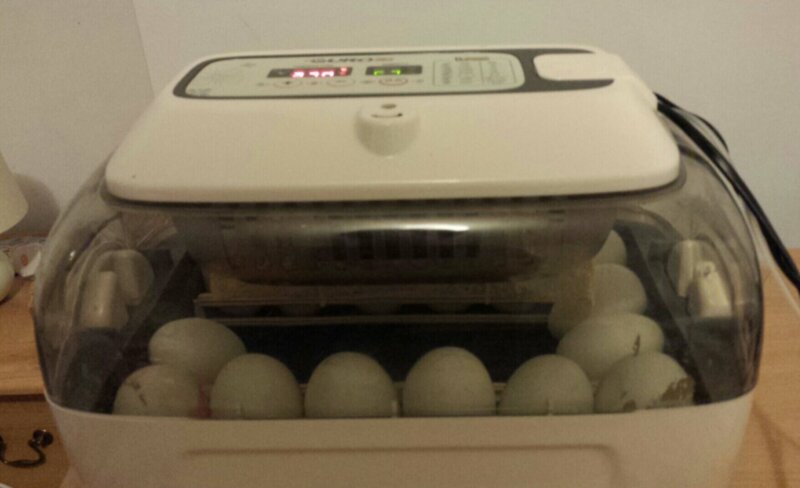 This evening I stopped the eggs turning (removed the turning cradle) and put the humidity up to 68% (from 45%) and the temperature down to 37deg (from 37.5) ready for the hatch in 3+ days. There are 13 Welsh Harlequin duck eggs and 2 of Lou and Carl’s ducks’ eggs which may be WH or WHxCall duck (will find out if they hatch)…all looking good so far. 3 of the WH eggs were cracked in the post. I used nail varnish to mend them. I’ve done that twice before but the eggs never developed. This time all 3 are progressing well. One of these eggs can be seen front left in the photo with the nail varnish on the right hand side of the egg – I suppose others might not have used bright pink nail varnish! !